The Newberry Medal is awarded each year to the author of the previous year’s most distinguished contribution to American literature for children. Runners-up are called Newbery Honor Books. The medal is named in honor of John Newbery. He was an eighteenth-century British publisher of juvenile books. He made it a priority to create books specifically for children. 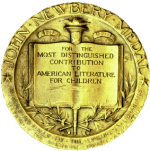 The Newberry Medal and the Caldecott Medal are the most prestigious American Children’s Book awards. No Award was given in 1923, 1924, or 1927. That is because no book was considered suitable. Learn more: official Newberry Medal homepage. In search of Long Arrow the Indian, Doctor Dolittle and his companions journey to the floating Spidermonkey Island. The adventures of a doll, carved from a piece of mountain ash, brought from Ireland to the state of Maine. At age thirteen Young Fu is apprenticed to a coppersmith in the big city of Chungking. Pioneer adventures of a girl growing up in northern Wisconsin. Lucinda spends a year on her own in New York city in the 1890’s while her parents travel abroad for her mother’s health. The legendary tale of the migration of the Huns and Magyars from the east to Hungary. Garnet lives on a farm in Wisconsin and has adventures all summer long. When Johnny’s hand injury prevents him working as a silversmith’s apprentice, he joins the American rebels as a messenger. Little Georgie and his friends welcome the New Folks to Rabbit Hill. Birdie Boyer and her family move to Florida to raise strawberries. Miss Hickory has a hickory nut for a head, but her body is an applewood twig. Professor William Waterman Sherman left San Francisco on August 15th, 1883 with the intention of flying across the Pacific Ocean. He was picked up three weeks later in the Atlantic Ocean clinging to the wreckage of a platform which had been flown through the air by twenty balloons. His only stop between San Francisco and the Atlantic Ocean was a brief sojourn on the island of Krakatoa, which blew up just after he left it in what is considered to be the most violent eruption of all time. Brought to Massachusetts as a slave, after forty-five years he was able to buy his freedom, moved to New Hampshire and set up as a tanner. When their new puppy, Ginger, disappears the Pye’s suspect the man in the yellow hat may be the thief.